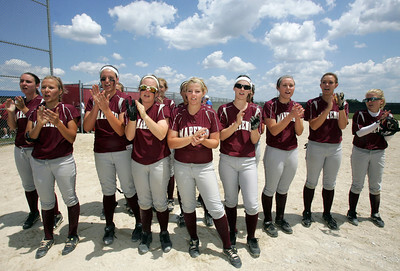 H. Rick Bamman - hbamman@shawmedia.com Marengo players sing the school song after defeating Burlington Central 3-0 in the Belvidere 3A Softball sectional Saturday, June 2, 2012. H. Rick Bamman - hbamman@shawmedia.com Marengo's Taylor Carlson (right) has Burlington Central's Lauren King out at the plate for the second out in the fifth inning of the Belvidere 3A Softball sectional Saturday, June 2, 2012. Marengo won 3-0. 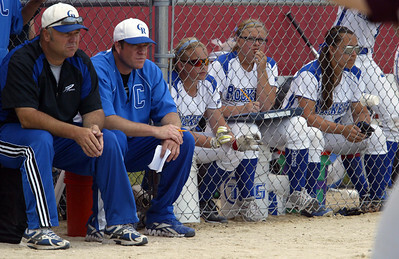 H. Rick Bamman - hbamman@shawmedia.com Burlington Central's bench watches the action late in the game in the Belvidere 3A Softball sectional. H. Rick Bamman - hbamman@shawmedia.com Marengo coach Dwain Nance gathers his team prior to the start of the Belvidere 3A Softball sectional Saturday, June 2, 2012. H. Rick Bamman - hbamman@shawmedia.com Burlington Central's Courtni Neubauer races to catch a flyball for the second out in the fouth inning against Marengo in the Belvidere 3A Softball sectional Saturday, June 2, 2012. Marengo won 3-0. 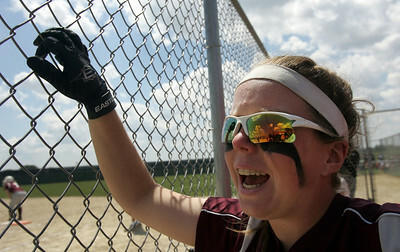 H. Rick Bamman - hbamman@shawmedia.com Marengo's Abby Kissack shouts encouragement from the bench during the Belvidere 3A Softball sectional Saturday, June 2, 2012. Marengo won 3-0. H. Rick Bamman - hbamman@shawmedia.com Marengo's Shae Karsten stumbles while trying to field a grounder near second base in the sixth inning Saturday against Burlington Central in the Belvidere 3A Softball sectional Marengo won 3-0 and faces Sterling Monday. 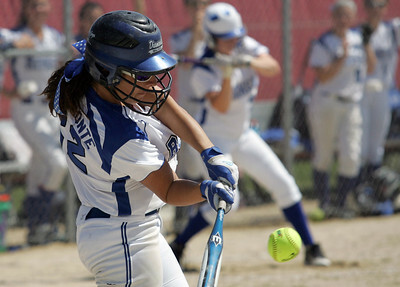 H. Rick Bamman - hbamman@shawmedia.com Burlington Central's Haley Albamonte takes a swing at a Lindsay Melson pitch. 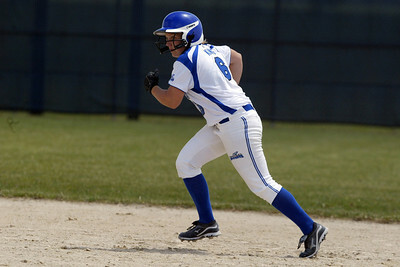 H. Rick Bamman - hbamman@shawmedia.com Burlington Central's Emily Bell had 3 hits in the Belvidere 3A Softball sectional. 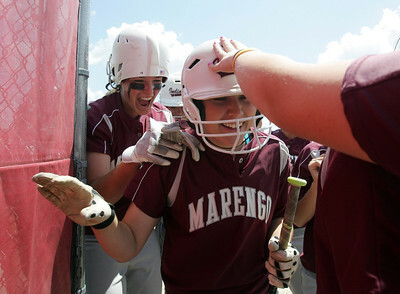 H. Rick Bamman - hbamman@shawmedia.com Marengo's Reed Karsten is welcomed by teammates back to the dugout after her inside the park home run against Burlington Central. 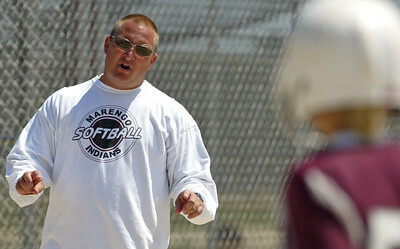 H. Rick Bamman - hbamman@shawmedia.com Marengo coach Dwain Nance gives encouragement to batter Larissa Pfieffer during the Belvidere 3A Softball sectional Saturday, June 2, 2012. Marengo won 3-0. H. Rick Bamman - hbamman@shawmedia.com The Marengo bench celebrates after Reed Karsten's inside the park home run in the third inning against Burlington Central in the Belvidere 3A Softball sectional Saturday, June 2, 2012. 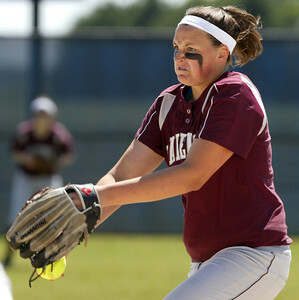 H. Rick Bamman - hbamman@shawmedia.com Marengo's Shae Karsten fields a gounder for the out at first. 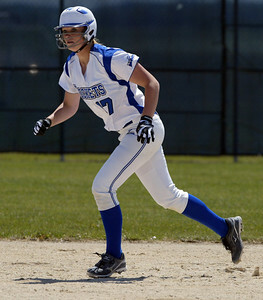 H. Rick Bamman - hbamman@shawmedia.com Burlington Central's Lauren King heads for third. 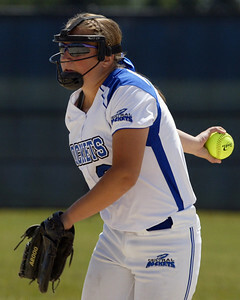 H. Rick Bamman - hbamman@shawmedia.com Burlington Central pitcher Angie Morrow faced Marengo batters. H. Rick Bamman - hbamman@shawmedia.com Marengo's Lindsay Melson faced Burlington Central in the Belvidere 3A Softball sectional Saturday, June 2, 2012. Marengo won 3-0. 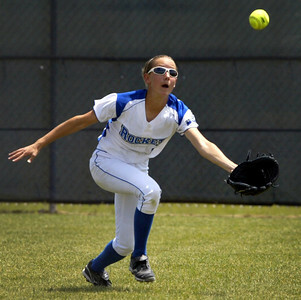 Burlington Central's Courtni Neubauer races to catch a flyball for the second out in the fouth inning against Marengo in the Belvidere 3A Softball sectional Saturday, June 2, 2012. 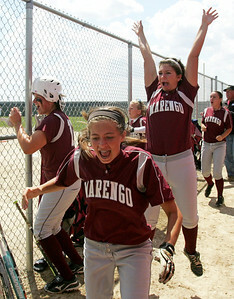 Marengo won 3-0.